What better present for my birthday than this?!! I’m not much around these days, taking a few days holiday, but I’ll be back soon with interesting news! 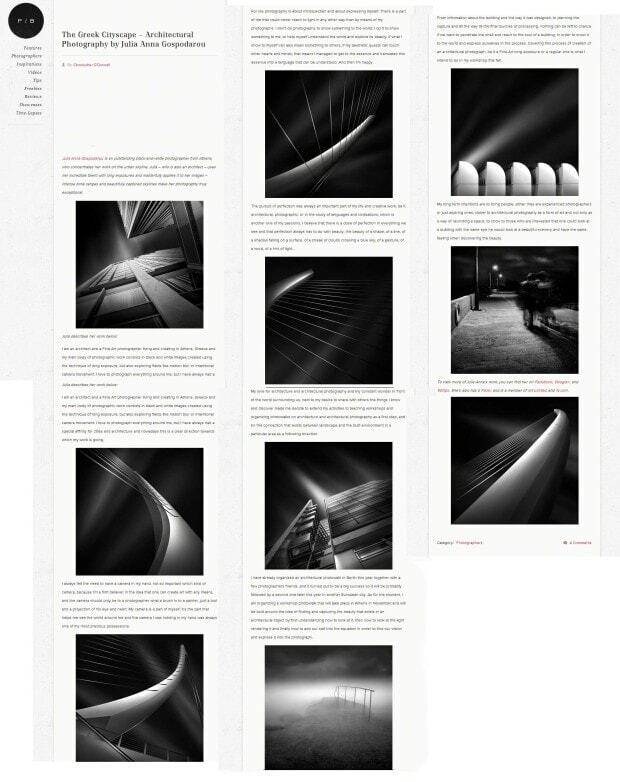 “I am an architect and a Fine Art photographer living and creating in Athens, Greece and my main body of photographic work consists in black and white images created using the technique of long exposure, but also exploring fields like motion blur or intentional camera movement. I love to photograph everything around me, but I have always had a special affinity for cities and architecture and nowadays this is a clear direction towards which my work is going. Architectural photography was a constant of my whole photographic journey and was ever present on my path, but landscape, especially seascapes, and also street photography are directions often present in my work. projection of his eye and heart. My camera is a part of myself, it’s the part that helps me see the world around me and the camera I was holding in my hand was always one of my most precious possessions. For me, photography is about introspection and about expressing myself. There is a part of me that could never reach to light in any other way than by means of my photographs. I don’t do photography to show something to the world, I do it to show something to me, to help myself understand the world and explore its beauty. If what I show to myself can also mean something to others, if my aesthetic quests can touch other hearts and minds, that means I managed to get to the essence and translated this essence into a language that can be understood. And then I’m happy. I’ve always been sensitive to the beauty that surrounds us, so sensitive that I sometimes feel the need to close my eyes to the ugliness around. That means, in photographic terms, that I’m not trying to capture what I see in front of me, instead I’m trying to capture what I feel about what I see. Yes, my photography is a very personal and a very subjective matter. I’m not interested in verdicts, in exhaustive interpretations, but I will always be fascinated by personal statements about the world we live in. And this is what I aim to present in my images. That is why my photographs don’t look like something one would normally see when looking around in real life, but rather like something one would imagine or dream about, not being limited in doing that by the apparent reality. I’m interested in discovering the essence of what I’m photographing, the ideal aspects and characteristics of a subject and present the impact that the things existing under the surface have on me. That’s why, without doing extensive manipulation to my images, my goal is to keep in the frame only what I consider being closer to perfection and ideal. My ideal. The way I present this ideal is by using light. Apparently, an obvious thing, since we are talking about photography, but what my approach is about is that even the light falling on my subject and its surroundings has to be ideal and pure in order to bring to life the perfection existing in my object.